Going on vacation is one of life’s great joys. Take the hassle out of travel by packing smarter with these tips. Roll your clothes: This one is a tried and true favorite. Everyone from flight attendants to moms have this tip on the top of their list. Not only does rolling take up less space in your bag, but it prevents wrinkles much better than folding. Turn whites inside out: And pack them in the middle. 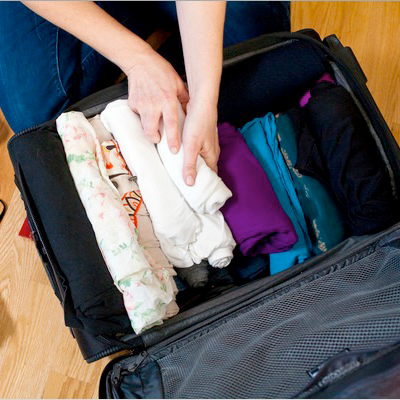 That way, if there is some dirt in your suitcase, your light clothes will stay pristine. Pack your shoes in your shower cap: Make use of those shower caps that your hotel provides and pack your shoes inside! Plan out each day: Pick out outfits that can work for each day of your trip, (bring one or two alternatives if you just can’t make a decision or are going somewhere that the weather changes frequently) that way you can make sure you’re not over packing or do as David Bromstead of HGTV suggests and pack two tops for every bottom. Bring a scarf for the plane: This one is a no brainer! Airplanes are cold! Plus then you have a chic accessory to throw over an outfit to completely change it up. Don’t be afraid to re-use: Re-work tops you’ve already worn by adding a cardigan or scarf over it. Pack a change of clothes in your carry on: If you do have to check a bag, be sure to pack at least one complete outfit (including a bathing suit if you’re going somewhere warm) in your carry on in case the airline loses your bag. Keep clothes in the same color family: That way you can mix and match outfits easier. Keep shoes to a minimum: Shoes are most often the bulkiest items in your bag. Bringing only the shoes you’ll need will help keep your bag free for other items. These flight attendants swear by flip flops. They suggest wearing them at the beach, around town and in the hotel. Be sure to pack comfy, broken in shoes if you’ll be walking around a lot. A pair of flats make any outfit look instantly chic. Leave room for souvenirs: If you pack too much, you can’t bring anything back! Be sure to leave some room in case you find something you just can’t live without along your journey.